Since the writing of the paper early in the year new developments have taken place in the war in Afghanistan and ,thus, impacting the costs of the war. These statements and estimates are subject to revision. It is a truism that the longer a war fought and the more intensely the higher the costs of the war. Both of these criteria apply for discussing and possibly measuring the costs of the wars in Afghanistan. The present war in Afghanistan started with the US led invasion on October 7, 2001, the longest war for the US and for Afghanistan. But for Afghanistan the present war was preceded first by the Soviet invasion on December 24, 1979 for a decade which was followed by civil wars before the US led invasion. Thus in Afghanistan there are the cumulative effects of these wars going on for 37 years and the costs of these wars have piled up on the Afghan people and on Afghanistan in all areas. On April 13, 2017 an unexpected event took place in the war; viz., CNN and other media sources reported on April 13-14, 2017, that the Mother of All Bombs (MOAB ) weighing 21,600 pounds and 30 ft. long was dropped on the Achin district of eastern Afghanistan; the largest non-nuclear bomb used for the first time in war. This bomb was bigger in size than either of the atomic bombs dropped on Japan in 1945. The full effects and implications of this action by the US against Afghanistan are not known especially on the people and on the environment. Many condemned this act including Hamid Karzai who had supported the invasion, and occupation saying “this is not the war on terror but the inhuman and most brutal misuse of our country as testing ground for new and dangerous weapons,” Twitter ( NYT April 14 2017 Asia Pacific). Currently Donald Trump has no declared strategy for ending the war. He has let he generals decide and there are expectations that another 5,000 US troops will be sent to enter the war. It is likely we will see more aerial attacks including the use of heavy bombers. The Taliban have steadily gained grounds in the fighting and now it is clear that the Afghan people are backing them across the country. The Taliban hold as much as 40% of the territory declared by the US Inspector General for Afghanistan Reconstruction (SIGAR) earlier in the year. They lost their government when the US and British invaded on October 7, 2001. They ruled most of Afghanistan during 1996-2001. They eliminated poppy cultivation and were recognized as a government by Saudi Arabia, UAE and Pakistan before they were toppled. Based on political public discussions America cannot afford to repeat sending a force of 140,000 along with another 40,000-50,000 from the NATO countries and ISAF, consisting of a ‘coalition of the willing’ of 45 countries, which took place at the height of intense fighting in 2010 when Barack Obama had sent the additional force of 30,000 in a major surge in 2009. Many members of the coalition have second thoughts about the war and have not declared support for renewed fighting. The only hope to end the war is through peace making and end of occupation. The Afghan people have always pushed back successfully against foreign occupation including the British and against the former Soviet Union. Gen. Mattis, US Secretary of Defense, has declared “we are not winning” the war and before him Gen. Nicholson the US-NATO Commander had declared the war is “ a stalemate”. These statements and the conditions on the ground in Afghanistan should lead to peace making, the Afghan people hope and expect. So do the people in America. This war has failed to bring peace, security, development, and justice. The costs to the Afghan society in each area have been significant and rising. The failing regime in Kabul with infighting, the massive number of refugees, the rampant corruption and rising crime, the deepening poverty, and massive unemployment, the abuse of power and neglect of the very needy, and the drug problem never experienced before are all costs to the Afghan society and economy. In many areas the costs are incalculable. For example, the severe drug problem where between 2-3 million Afghans have become addicted especially the young since 2002 in the post invasion year when the cultivation of poppies and manufacturing of opioids mushroomed is nearly impossible to estimate. These costs are observable and they will impact the society in the long run. Without peace security cannot be established and without development in the broader economy many social programs and social justice will not be attained. A handful has become very rich and powerful while the masses linger on with subsistence level living. There are private and social costs involved which cannot easily be estimated. Again they are observable and are long run costs. Where are the Costs Concentrated? The Afghan Economy during the Soviet War, April 22, 2016, Xlibris.com, Chapter I, Tables 8-9. Estimates about the number of villages destroyed ( 11,412) and the percentage losses for the animal stocks are given in these tables along with the discussions. The Soviet war policy was to depopulate villages since the Resistance ( Mujahideen) was drawn from the villages. For the present war the US and NATO war policy has been to remove areas of Resistance ( the Taliban) through aerial attacks and night raids. Both super power wars failed to achieve their goals which meant the rural communities and all their means of living were severely impacted and the full impact of the present war continues and remains largely unknown. The refugees from the present war in Kabul and elsewhere may provide the needed information. Estimates are not available about the harm done to the villages during the present war since 2001; no similar surveys have been made nor has extensive reporting been done by the media to determine the effects of this war. The media has been kept out of the war zones. The costs of the wars to the Afghan society are more observable and measurable from the refugee and IDP population as a distinct part of the society. The Afghan society impacted by war cannot absorb its refugee population and have the refugees gainfully employed. This measure of the impact of the wars increased over time and clearly is of much concern for peace, security and development. New internally displaced persons numbered 30,0000 were added resulting to 1.3 million displaced in 2016 and another 90,000 were added during the first quarter of 2017 UN reports show. More than 4.3 million did return from Pakistan and Iran during 2002-2005 and many of them are part of the long term displaced Afghans being unemployed. There are still large numbers of Afghan refugees in Pakistan and Iran who cannot return due to the conditions in Afghanistan. There is continued high unemployment of 40-60 percent throughout much of the country and the accompanying high levels of prevalent poverty. These are costs of the war, but, cannot be readily measured. Since the departure of most of the foreign contingents at the end of 2014 the demand for the sector that served the foreign forces and recycled the income throughout the rest of the Afghan economy has dried up. On top of the costs of the war per se, such a collapse in income has had dramatic impact. The Director of the UN Office of Coordination of Humanitarian Affairs ( OCHA) recently stated in Kabul that, “more than nine million people in Afghanistan – one third of the population – are food insecure; an average of 165 children under the age of five die every day; and an Afghan woman dies every two hours due to pregnancy-related causes. One of the most dramatic impacts of the costs of the wars has been the reduction in the average life span in Afghanistan. The average life span has been lower by 10-15 years among the Afghan people in comparison to all of the neighboring countries with common borders with Afghanistan. The claim that life expectancy has been raised to 60 years during the last decade or so is not substantiated. Office of the UNOCHA, stated that 80 percent of the 1.6 million Afghan refugees in Pakistan do not want to repatriate to Afghanistan due to insecurity, lack of jobs and lack of official support for resettlement. These conditions are costs of the war. They cannot be estimated in monetary terms. Estimated 370,000 people have died due to direct war violence, including armed forces on all sides of the conflicts, contractors, civilians, journalists, and humanitarian workers. It is likely that many times more than 370,000 people have died indirectly in these wars, due to malnutrition, damaged infrastructure, and environmental degradation. 200,000 civilians have been killed in direct violence by all parties to these conflicts. 10.1 million Afghans, Iraqis, and [ trible Pushtuns between Afghanistan and ]Pakistan are living as war refugees and internally displaced persons, in grossly inadequate conditions. The wars have been accompanied by erosions in civil liberties and human rights. For the US the cost for the Iraq and Afghanistan/Pakistan wars totals about $4.8 trillion. This does not include future interest costs on borrowing for the wars, which will add an estimated $8 trillion through 2054. For Afghanistan at least 100,000 Afghans have been killed . Indirectly probably another 100,000 have been killed due to the indirect effects of the war if we assume the same proportionality used by the Watson Institute in making their direct and indirect estimate of the human costs of the war since 2001. Estimates of the annual number of Afghans killed during 2001-2014 are provided from Wikipedia in the body of the paper. They are subject to revisions as more facts are discovered. During the Soviet war estimates are that 150,000 Afghans were killed yearly during 1979-1989 and the total may have been 1.95 million killed and 1.5 million may have been disabled or wounded. (Cf., Chap. 9 and the Appendix , The Afghan Economy during the Soviet War, op. cit.). Due to the fact that many have written about the illegality of these wars it goes without saying that the costs of these wars could have been avoided had the Bush Administration and certainly the Obama Administration had used diplomacy rather than war. Here the focal point are the losses during the war and occupation years as well as the communist rule. These estimates should be considered as a baseline measure and as such are preliminary. However, much of these estimates are founded on actual losses in different areas based on years of research and findings. Any new findings will in all likelihood show that the losses were greater than estimated in this study. For this reason the estimates here should be considered as the minimum for any legal proceedings for the demand for war damages. Losses from Gas Exports and Mineral Exploitations Estimated at $1.039 billion. The surveys for mineral explorations were carried by teams of Afghans and Soviet geologists in prior decades. For the purpose of this study an unknown amount of loss from possible extraction and exports of unrecorded mineral resources is represented by the symbol X and is included in the overall equation measuring losses. All other losses including destruction of institutions, harm from the millions of mines laid, probable use of chemical weapons, tens of thousands of Afghan children kidnapped are given by the symbol Y amount. 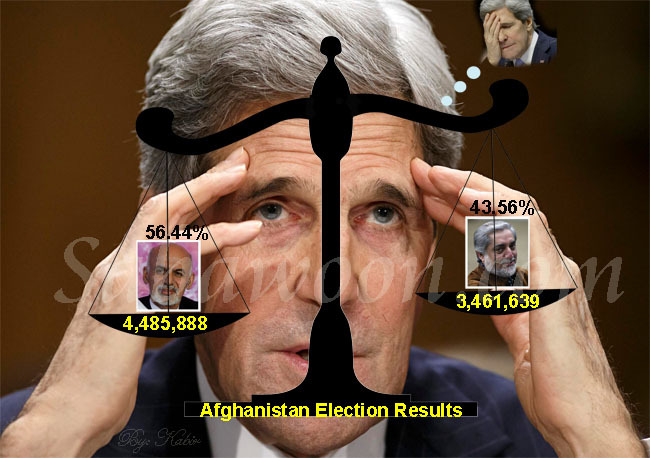 Thus, Total losses inflicted on Afghanistan, its economy and society at least amounted to: $ 319.2478 billion + X +Y. More information in the areas defined by the symbols X and Y are required to monetize the losses experienced by Afghanistan. NATO : “The war in Afghanistan- an open letter” May 24, 2017, www.Dawat.net , and www.Sabawoo.com .